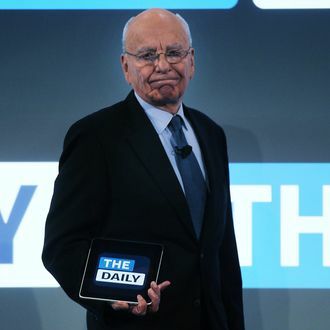 Earlier this month, News Corp.’s expensive iPad newspaper experiment The Daily was reported to be “on watch” and “at a crossroads” as the company spun off its less successful publishing business. To that, editor-in-chief Jesse Angelo insisted that his staff ignore “the latest misinformed, untrue rumors of our imminent demise.” In a public memo, he urged employees to pay attention to the publication’s 100,000-plus subscribers, “not the haters,” and added, “As something new and different, we are an easy target for erroneous wishful thinking. But make no mistake, we will be nimble and we will compete.” Being nimble, it turns out, includes laying off 50 of its 170 employees. Today, we are introducing a navigational improvement many users have asked for: a back button on the top left corner that returns you to the page you came from. For the time being we are also locking the app in portrait mode. Video will still be available in landscape mode. We have some other ideas about how to create unique features in landscape and will continue to experiment and innovate in this area. He then adds that the sports section will rely mostly on photo galleries and content from Fox Sports, not original reporting, while the editorial section will be absorbed by news. “We have consistently remained one of the top-ranked paid news apps since our launch, we have steadily grown our subscriber base, and we have the world’s largest media and publishing company behind us,” said published Greg Clayman. “Like all good digital products, however, we must change and evolve to remain fresh, competitive and sustainable.” But in a horrible instance of bad timing, Clayman was reported this morning to have recently closed a deal on a $1.16 million townhouse.